Tin Tin, a twenty-two-year-old Malayan girl, is the daughter of Kyrano, Jeff Tacy's faithful servant. She received an education in America and Europe, Jeff Tracy paying all expenses in gratitude for Kyrano's loyal and devoted services. After completing her studies, Tin Tin joined International Rescue as an active member of the organisation. With her degrees in higher mathematics and advanced technical theory and engineering, she can work closely with Internation Rescue's engineer and scientist, Brains. 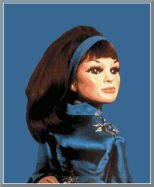 She checks and re-checks all the Thunderbird machines and organises all maintenance - with her skill and knowledge she has repaid Jeff Tracy over and over again for his generosity in financing her schooling. Feminine and sweet, and yet highly intelligent, Tin Tin is a true credit to International Rescue, proving that women can be a great asset to such an important organisation. Tin Tin has a definite fondness for Alan Tracy.